There are several ways to properly wean your calves with the slightest amount of stress possible. 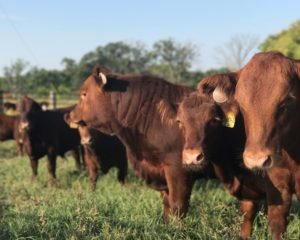 For us at Bachman Cattle Farms we choose to do fence-line weaning. The calves are brought up to the barn and then sorted off and brought through the chute for a series of measurement exams. When they are born we weigh and take their hip heights so at weaning and yearling performance exams we can get their adjusted measurements for better data recognition. After they are done with their measurements they go to the pasture next to the barn for easy monitoring. The cows are then brought in for measurements as well. We will collect data such as; weight, height, body condition score, claw set, and foot angle. We then move them to the pasture that is eligible for nose to nose contact. Fence-line weaning decreases the amount of pacing and bawling associated with being separated for the first week or so. 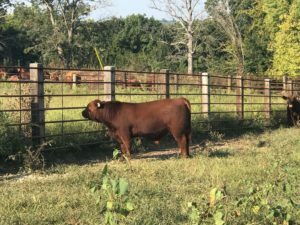 It also has the ability to increase the health and performance of both cow and calf, all while decreasing stress and separation anxiety. 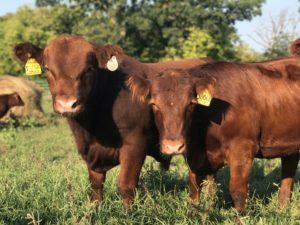 By now all of the cows that have been weaned should be gestating and this also helps keep the unborn fetus in a great deal of health as well. Here are a few pictures of the calves that were weaned Monday!